Linda Beigel Schulman of Dix Hills, holding a photo of her son Scott, meets with Governor Andrew Cuomo in Albany Tuesday prior to votes in the state legislature on a series of gun control bills. 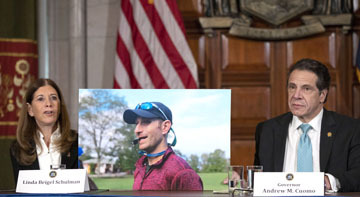 Scott Beigel was killed protecting his students during last year’s Parkland shooting in Florida. New York State lawmakers passed Tuesday a series of bills to strengthen the state’s gun control regulations. The legislative package easily passed the Assembly, long a Democratic stronghold, and also garnered a sizable majority in the Senate, where Democrats regained control earlier this month. The gun control legislation was the first to pass both houses of the legislature since 2013, when the Secure Ammunition and Firearms Enforcement Act was approved weeks after the mass shooting at Sandy Hook Elementary School in Connecticut. Gaughran, who supported the legislation, was joined on the Senate floor by Dix Hills residents Michael Schulman and Linda Beigel Schulman whose son Scott Beigel was killed while protecting his students during last year’s mass shooting in Parkland, Florida. “I know that no matter how senseless and no matter how incomprehensible the Parkland massacre was, Scott's murder was, when we pass the Red Flag law… Scott's murder will now save lives,” she said. A second bill prevents school districts from allowing teachers to carry guns in schools. The bill prevents K-12 schools from authorizing anyone other than a security officer, school resource officer or law enforcement officer to carry a firearm on school grounds. Other legislation approved Tuesday would ban the sale and manufacture of a device that accelerates the rate of fire of a firearm, such as bump stocks. Dix Hills residents Linda Beigel Schulman, right, and Michael Schulman, left, join Senator Jim Gaughran on the floor of the State Senate for passing of gun control legislation. Lawmakers also approved the creation of regulated gun buyback programs and established an extension of up to thirty-days when required for national in-state background checks. Democratic governor Andrew Cuomo is expected to sign the gun control legislation into law in the coming days.